British Furniture Manufacturers (BFM) is a trade association; an employers’ organisation and member of the European Furniture Manufacturers’ Association (UEA). 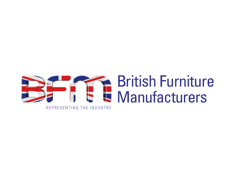 The BFM has represented the interests of the British furniture industry for over 65 years and is run by members for the benefit of members and the wider industry. The BFM strives to represent the membership in safeguarding and promoting standards and best practice, both nationally and internationally, in conjunction with the provision of a wide range of services including legal, employment & personnel, training, health & safety & environment, and technical to positively impact on the compliance and competitiveness of members’ businesses at home and overseas. In addition the BFM lobbies and advances the interests of the furniture industry, directly with government and through membership of the British Furniture Confederation (BFC) and the All Party Parliamentary Furniture Industry Group, constituting an effective voice in furniture to best serve the interests of this industry. The key industry sectors represented by manufacturing companies in BFM membership include upholstery, cabinet, bathroom, kitchen, office, mattress and beds. The importance of the supply chain is also recognised by the BFM through associate membership of materials and components suppliers, furniture and furnishings retailers, distributors and ancillary companies to the trade.